Felt like something off-beat and funky today. Here is and example of some street photography that I’ve done. I think I took this photo from my hip and just hit the shutter button. 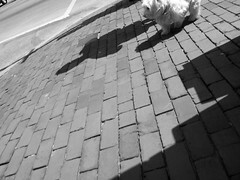 This is the result….a fun dog, wacky horizon, and cool shadows. My back is still really bugging me so that’s why my posts here have been brief of late. Hey, at least I can still post!